If the cargo had actually arrived in Gothenburg, the ship would have brought in 2.5 million Swedish Daler Silvermynt, an enormous amount of money at that time. As a comparison, the monthly salary of a sailor among the crew would have been around 2 Daler Smt. The Gothenburg shipwreck was located close to the Gothenburg harbor and everything on board that could be salvaged was probably also salvaged soon after the foundering in 1745 and during the following year. According to contemporary documents in the City archive, wet tea was dried in available baking ovens in the city "after which an unprecedented invasion of huge, newly hatched, roaches invaded the city". Since the porcelain chests were according to standing orders lining the bottom of the hull a considerably amount if not all was left where it were, under tons upon tons of soggy tea, 'gallingall' and broken chests. On 28th November 1745 we know that 30 tons of tea, 80 bundles of silk brocade and 'various porcelain' was auctioned off. As a result of efforts made in 1746 and 1747, apparently all the cannons were recovered but only a small part of the cargo, which by then was severely water damaged. It seemed like altogether about 8% of the 370 tons of tea aboard the ship was salvaged. During the years to follow most of what could be salvaged was taken up and auctioned. From available documents it would seem that beside one tenth of the tea cargo a fifth of the other cargo were salvaged. Still, so large were the profits of the East India trade that this was enough to pay for the costs including the loss of the ship and still give 14½ % in dividends to the participants. By the time of the mid 19th century the old oak hull had now blackened and become attractive for making furniture. Several attempts were thus made to bring up as much as possibly of this hard and valuable wood. To this end several diving companies approached the wreck and at least some of them seems to have used dynamite to pry the hull apart. In later salvaging attempts in 1864 and 1876 pieces of oak were salvaged and additional small quantities of porcelain were recovered. Johan Kjellberg, diving in 1860s succeeded in taking up 77 dozen pieces of porcelain. According to newspaper reports from 1877, Captain Lampa and James Bourn recovered "a lot of porcelain… consisting of tea and coffee cups and saucers, large and small places, tea and coffee pots, etc". 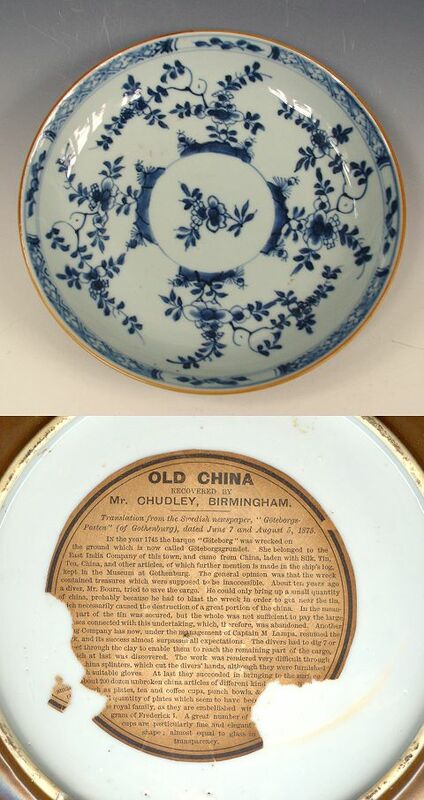 "Old China, recovered by Mr. Chudley, Birmingham, 1875"
On the base of one shallow bowl of typical 'Gotheborg' decoration, a darkened paper label with a translation from Gothborgs-Posten of 1875 is found under the headline 'Old China, recovered by Mr. Chudley, Birmingham'. IN the year 1745, the barque "Göteborg" was wrecked on the ground which is now called Göteborgsgrunded. 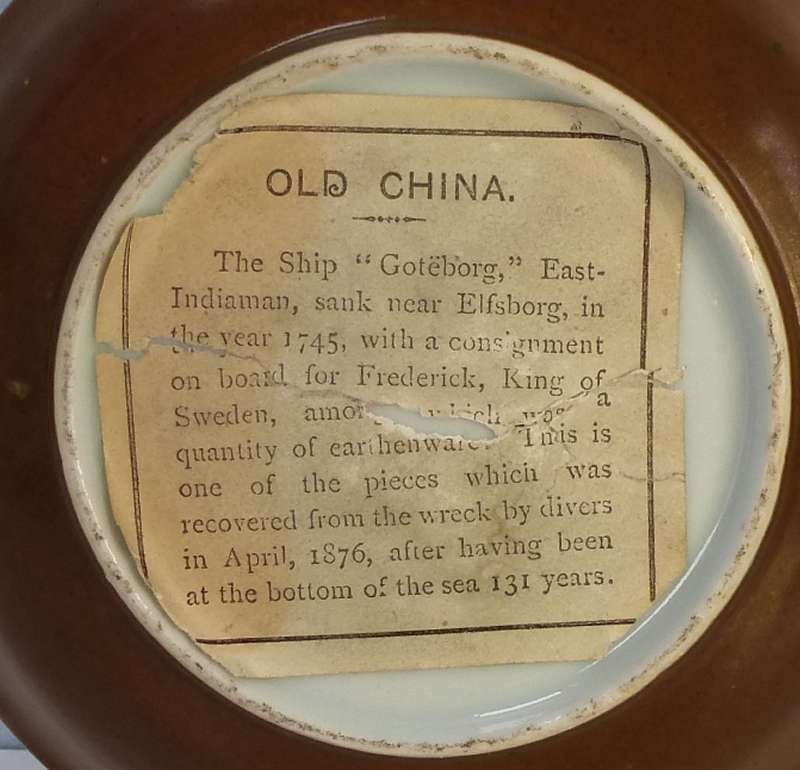 She belonged to the East India Company of this town, and came from China, laden with Silk, Tin, Tea, China and other articles, of which further mention is made in the ship's log, kept in the museum at Gothenburg. The general opinion was that the wreck contained treasures which were supposed to be inaccessible. About 10 years ago, a diver, called Mr. Bourn, tried to save the cargo. He could only bring up a small quantity of china, probably because he had to blast the wreck in order to get near the tin, which necessarily caused the destruction of a great portion of the china. In the mean [time] part of the tin was secured but the whole was not sufficient to pay the large [exp]nses connected with this undertaking which therefore was abandoned. Another [divi]ng company has now, under the management of Captain M Lampa, resumed the [...]k, and its success almost surpasses all expectations. The divers had to dig 7 or [... f]eet through the clay to enable them to reach the remaining part of the cargo, [w]ich at last was discovered. The work was rendered very difficult through [...] china splinters, which cut the divers' hands although they were furnished [wit]h suitable gloves. At last they succeeded in bringing to the surface about 200 dozen unbroken china articles of different kind [...] such as plates, tea and coffee cups, punch bowls & [...] small quantity of plates which seem to have been [...] the royal family, as they are embellished wit[h ..] [... mono]gram of Frederik I. A great number of [...] cups are particularly fine and elegant [...] shape; almost equal to glass in transparency. 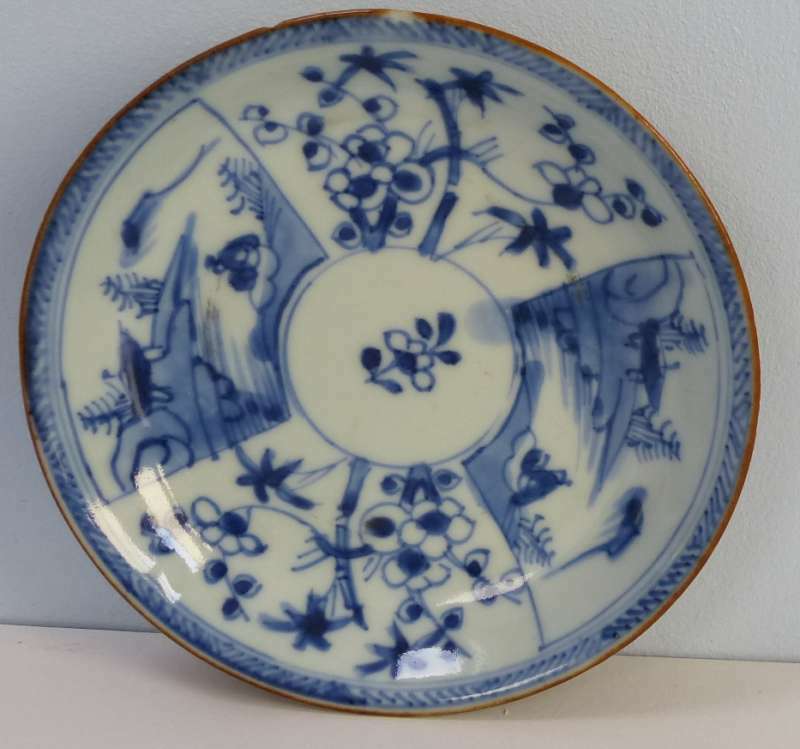 On a similarly identified dish a shorter version is found, dated April 1876. In 1906-07 James Keiller the Younger made another more ambitious salvaging attempt. According to the accounts, the result of this effort was that not less than 4,300 pieces of porcelain were recovered, plus a large number of porcelain shards. Yet of the entire porcelain cargo, of between 500,000 - 700,000 pieces and hundreds of thousands of objects, only a small fraction could possible have been recovered after the ship went down.